LA MALBAIE /Canada/, June 10. /TASS/. The G7 leaders have stated their intention to step up sanctions against Russians should its actions so require, according to the final communique adopted on Saturday after the end of the two-day G7 summit in La Malbaie, Canada. "We also stand ready to take further restrictive measures in order to increase costs on Russia," said the leaders of the UK, Germany, Italy, Canada, the US, France and Japan. The G7 leaders said that the abolishment of sanctions against Russia depends on Moscow’s implementation of the Minsk accords. "We recall that the continuation of sanctions is clearly linked to Russia’s failure to demonstrate complete implementation of its commitments in the Minsk Agreements and respect for Ukraine’s sovereignty and we fully support the efforts within the Normandy Format and of the Organization for Security and Cooperation in Europe for a solution to the conflict in Eastern Ukraine." Moscow repeatedly said in response that the warring sides in eastern Ukraine should be called on to observe the agreements, not Russia. "We reiterate our condemnation of the illegal annexation of Crimea and reaffirm our enduring support for Ukrainian sovereignty, independence and territorial integrity within its internationally recognized borders," the declaration says. According to the declaration, the Group of Seven leaders are still determined to provide comprehensive help to Ukraine in carrying out reforms. In addition, the G7 leaders demanded that Moscow should stop supporting Syria’s authorities. The communique contains the appeal "to cease its destabilizing behaviour, to undermine democratic systems and its support of the Syrian regime." Still, the G7 leaders announced that they will further cooperate with Moscow in addressing international crises, but specified that it will be possible only if the G7’s interests are observed. "Notwithstanding, we will continue to engage with Russia on addressing regional crises and global challenges, where it is in our interests," the communique says. The G7 leaders have agreed with the UK’s statement that Russia is highly likely responsible for the incident in Salisbury, according to the final declaration that was adopted on Saturday after the end of the two-day summit in La Malbaie, Canada. "We condemn the attack using a military grade nerve agent in Salisbury, United Kingdom. We share and agree with the United Kingdom's assessment that it is highly likely that the Russian Federation was responsible for the attack, and that there is no plausible alternative explanation," the document says. On May 18, Salisbury District Hospital Chief Executive Cara Charles-Barks said that Sergei Skripal was released from the hospital. His daughter Yulia was reported to have been discharged from hospital on April 10. 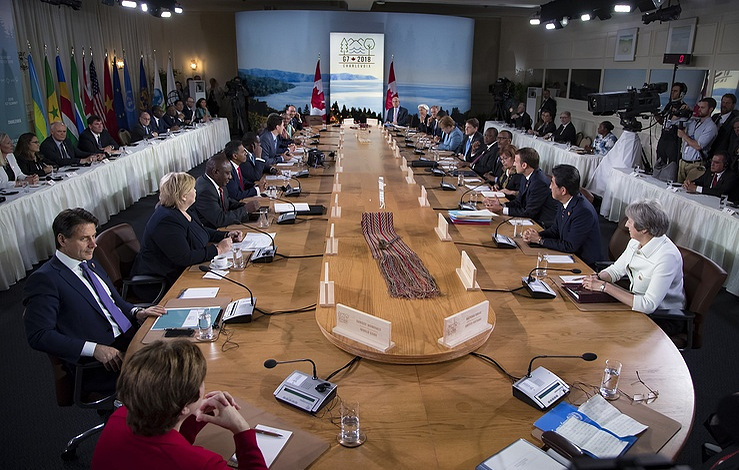 Leaders of the G7 countries have reached agreement on setting up a mechanism of prompt reaction to the activities of hostile countries, Canadian Prime Minister Justin Trudeau told a news conference on Saturday upon the end of the annual G7 summit in La Malbaie, Quebec. Trudeau said the conferring countries had assumed an obligation to take concrete steps for defense of their ‘democratic systems’ from external threats and to conduct coordinated policies to expose those would who try to harm them. The G7 leaders have agreed to take measures to ensure that Iran’s nuclear program remains peaceful, according to the final declaration adopted on Saturday after the end of the two-day summit in La Malbaie, Canada. "Recognizing the threat Iran’s ballistic missile program poses to international peace and security, we call upon Iran to refrain from launches of ballistic missiles and all other activities which are inconsistent with UNSCR 2231 - including all annexes - and destabilizing for the region, and cease proliferation of missile technology. We are committed to permanently ensuring that Iran’s nuclear program remains peaceful, in line with its international obligations and commitments to never seek, develop or acquire a nuclear weapon," the G7 leaders said in the statement. "We condemn all financial support of terrorism including terrorist groups sponsored by Iran. We also call upon Iran to play a constructive role by contributing to efforts to counter terrorism and achieve political solutions, reconciliation and peace in the region," the statement says. On May 8, US President Donald Trump declared Washington’s withdrawal from the Joint Comprehensive Plan of Action (JCPOA) - a deal which restricted Tehran’s nuclear developments in exchange for the abolishment of the sanctions introduced by the UN Security Council and the unilateral restrictions earlier introduced by the US and the EU. He promised both to return the old restrictions and introduce new ones. The leaders of the UK, Germany and France - Theresa May, Angela Merkel and Emmanuel Macron - have called on all the members of the deal to continue to fully implement it. Iranian President Hassan Rouhani said that the European Union should guarantee for Tehran the observance of its interests under the JCPOA in order to preserve the deal in force. Iran confirmed its intention to remain in the JCPOA and continue to observe its obligations. The G7 leaders have stated their intention to continue the fight against Islamic State (IS, a terror organization, outlawed in Russia) in Syria and denounced the use of chemical weapons in this Arab country, according to the final communique adopted on Saturday after the end of the two-day G7 summit in La Malbaie, Canada. "We strongly condemn the murderous brutality of Daesh [the Arab name for IS - TASS] and its oppression of civilian populations under its control," the document says. "As an international community, we remain committed to the eradication of Daesh and its hateful ideology." The document also condemns "the repeated and morally reprehensible use of chemical weapons," placing responsibility on both IS and Syria’s authorities. "We call on the supporters of the regime to ensure compliance with its obligation to declare and dismantle remaining chemical weapons," the document says. The communique also calls "for credible, inclusive and non-sectarian governance in Syria, facilitated by free and fair elections held to the highest international standards of transparency and accountability, with all Syrians, including members of the diaspora, eligible to participate." Following a massive gas attack in Eastern Ghouta, a suburb of Damascus, in September 2013 the UN Security Council adopted a resolution on chemical weapons destruction in Syria. As many as 1,200 tonnes of poisoning agents were transported from the country and destroyed in 2014. Nine countries, including Russia, took part in the operation. Still, the Organization for the Prohibition of Chemical Weapons (OPCW) believes that the authorities in Damascus did not fully disclose the country’s chemical weapons program.